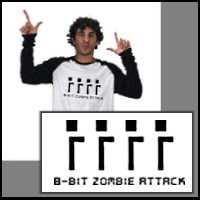 Harken back to ye olde days of 8-bit graphic gaming with this fearsome display of an attacking horde of Zombies. See how the little sticks that sort of look like arms reach out from the general body area under the blob that most likely represents a head. Scary!